A hundred years ago… this week, the horrible attrition of trench warfare continued with the French Army’s fizzling Loos-Artoise Offensive and withering 2nd Battle Of Champagne. And – strange detail, probably not widely known – on October 31 the British Army introduced steel helmets, but only on the Western Front (they never reached Gallipoli, or certainly not Suvla Bay where my father’s Royal Fusiliers were fighting). In the east, the Russian Army’s general retreat across (modern-day) Latvia, Ukraine and Belarus proceeded, but still slowed and sometimes interrupted by relentless resistance to the Germans in battles at Illukst, Uxkull and Chartorysk (all October 25), the Styr (27) and Dvina (28) rivers and Tarnopol, Galicia (30). Further south, the Bulgarian and German conquest of Serbia went ahead in orderly fashion with barely a setback, although a substantial French force landed in Salonika/Thessaloniki with some British and Italian support to further defend Greece against Bulgarian attack (the French-v-Bulgar Battle Of Krivolak, Macedonia, begun on October 17, still raged). The wider “world” aspect of the war saw more action in German colony Cameroons, where the French took Sende and a third British onslaught on the German’s northern fort at Mora petered out (October 30-November 4). Last week, while sleeping in his trench at Suvla Bay, my father got a centipede bite between his fingers and it turned so septic his arm swelled grotesquely to the shoulder and his left hand “looked like a frog”. After rejecting the idiot Battalion MO’s offer of No. 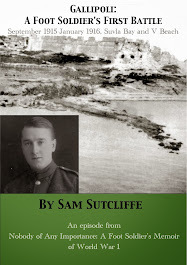 9 laxative pills, delirious, he tottered to a nearby tented RAMC field hospital on a hilltop. There he got the treatment he needed – which involved a gruesome process of lancing his hand and squeezing out bowlfuls of pus. After a few days, the doctor there cleared him to return to his Battalion. ‘As I walked down the hill, the awkwardness of my present position began to worry me. I had the vest, pants, socks, boots, and tunic trousers I was wearing when I left my post to seek medical help. Nothing else. No rifle. No pack… and it had contained all my personal belongings including a towel and soap, an unwashed set of underwear and socks, and my two bottles of water-purifying tablets. I had wandered off a fortnight earlier, suffering so badly from the poison that I hardly knew or cared what I was doing or where I was going. I had departed without authority to do so; that might be adjudged desertion from my unit – on active service, one of the most serious crimes a soldier could commit. I was convinced I had at least told my mates I was going to see the Medical Officer and perhaps one of them had told our Sergeant or an officer. Would old Number 9, our long, miserable streak of an MO, recollect my appealing for his help or was his memory as bad as his knowledge of medical matters? 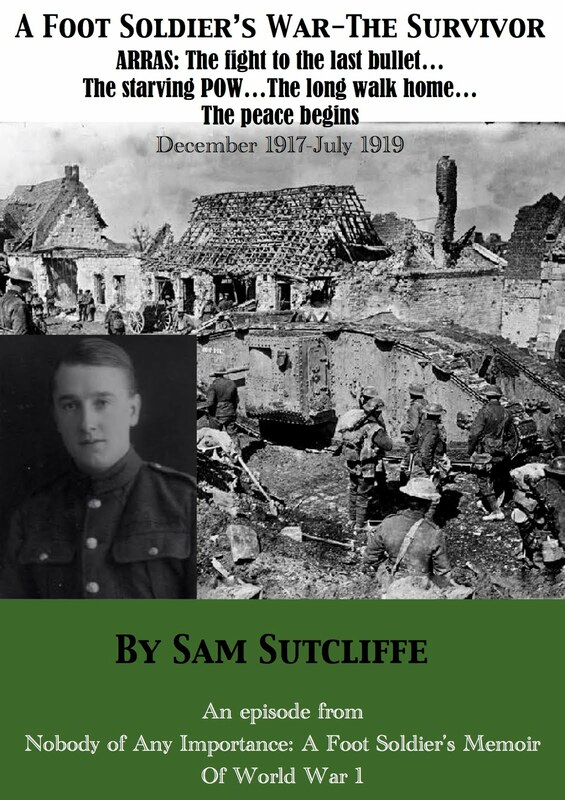 I hurried across the open country between the little Field Hospital and the beginning of the trench system without stopping a bullet or anything equally lethal. When I slipped down into a communication trench leading towards the front line, I soon encountered a chap I knew and liked, named Whiting. He gave me all the news as he’d heard it. The part of it concerning myself proved both reassuring and disappointing. The pals I’d left behind had more awareness of my trouble than I’d suspected. They had given the appropriate NCO lurid details of my condition – the throbbing, twice-its-normal-size hand and arm – and he formed the opinion that, even if I did not die, I would be put aboard a hospital ship and would not return to my unit. It happened that, because of a lack of senior NCOs, this Sergeant suddenly found himself in charge of supplies for our Company. So he decided that my tablets should he distributed among our chaps in the front line to help keep them free of the dysentery that was knocking out so many men. ‘I didn’t actually rejoin my Company, because a request had come through from Brigade Headquarters for a Signaller to be sent to a hill with a commanding view of Turkish positions. There, to provide some protection for our men in forward positions, they had decided to bring together all the machine gunners from the four Battalions constituting the 88th Brigade. This Brigade, part of the famous 29th Division, was composed of regulars, the good old soldiers who made a career of serving their country in peacetime as well as in war. I felt proud to be allowed to join them, for I had seen how much better their organisation was than ours. I found my way to the machine gunners on the hill. Below us, in places, I could see the trenches of our forward positions; quite a network had been constructed by now and I ruefully admitted to myself that the steam had gone out of the whole operation, the purpose bogged down in holes and trenches. The machine gunners could give useful fire cover to our chaps down there should they be attacked. But why should the Turk bother to attack? He must have concluded by now that the British had failed in their original objective and that, if he came forward to drive us into the sea, he would suffer many casualties and gain only a useless strip of land. Leaving us where we were to face a winter in terrible conditions was the better strategy; we would have the awful burden of trying to get supplies ashore in bad weather to troops who had, in many cases, fallen victim to sickness and depression. Meanwhile, the Turks could withdraw some of their men to reinforce their other fronts. As a Lance Corporal, with one man to assist me, my job was to maintain communications with 88th Brigade Headquarters. Clearly, that meant one man resting, one on duty. I talked over the possibilities with my helper, and we decided to try doing four hours on and four off, night and day. We occupied a square hole, about six feet each way, with no roof. A short trench joined it to the main trench along the top of the hill. This was to be my home. Although on a hilltop, these trenches had been dug into the same soft, layered rock as those first holes we’d worked so hard to excavate down near the beach, so their unstable walls constantly flaked away. My first Signaller mate there* was a pleasant chap, quite a philosopher in his way, probably my senior by four or five years. He showed me photographs of his parents and a sister, and I warmed myself in the glow of love emanating from him as he talked about them and their life together before the war. A good worker too, meticulous in his time-keeping, he woke quickly during the night when the luminous dial on my watch told me four hours had passed and I nudged him to take over. But it was all very difficult and uncomfortable. Even though the autumn weather in that little strip of Turkey remained dry – pleasant, really – we learned that four hours on, four off, meant we never had a satisfactory sleep. So we experimented with two on, two off, eight on, eight off, every arithmetical combination we could think of to cover the 24 hours. Nothing really worked. When you took over after whatever interval, your mate, released from that crampy corner of the hole we lived and worked in, should have felt free for some hours of beautiful sleep – but was he? On duty, you must want to go to the bog some time, so your mate had to wake up and take over. During the day, you would need nourishment, so your mate had to procure it, and very often cook it on our small meths heaters. Actually, we catnapped day and night and just made the best of a terrible existence. 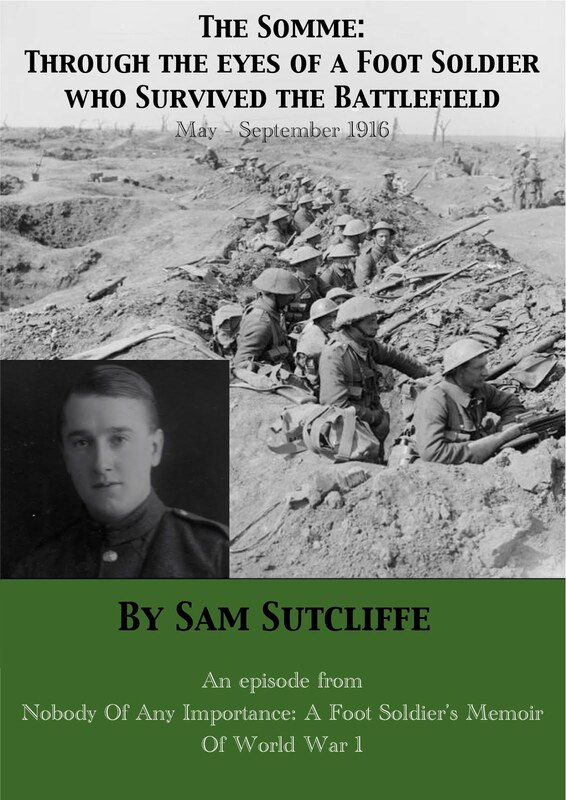 Next week: Sam does Bill Jackson a kindness – he ends his war ­– but gets glum Harry Green as his new hole-mate… still, the Essex machine gunners scrounge a beef feast! A hundred years ago… to and back actions proceeded on Western and eastern Fronts with the British repulsing a German attack near Hulluch in Pas-De-Calais (Oct 19) and advancing somewhat in the vicinity of Schwaben (21), while the Russian Army captured Chartorysk (Ukraine) and held on near Riga (Latvia, both 18), and the German Army advanced on the Dvina (18, Russia) and took Illukst (23, Latvia). Last week, as a Signaller, Sam took his turn at running telephone wires out to new advance posts in No Man’s Land under cover of darkness – while hoping a random sniper’s bullet wouldn’t find him. Already he shared the prevailing sense that the campaign lacked leadership – “We all felt it and cursed it” (see 11/10/15 blog). Young as he was, he reserved particular scorn for the Commander-in-Chief, General Hamilton, and derived little encouragement from his Battalion’s Colonel’s lone, brief appearance in the front line – just to secure a medal, he suspected – scuttling bent double through a place called Borderers’ Gully. ‘I suffered a sad loss in that gully, when we had to leave it and move forward in a hurry. Through all our travels I had carried in my haversack the flageolet I used in the Scouts’ band. When I got the chance, I would quietly play some of the choruses then popular, particularly ragtime songs – Everybody’s Doing It, You Made Me Love You, and Alexander’s Ragtime Band. It seemed to make a link with home for a brief moment. ‘The Medical Officer mentioned above [in last week’s blog] – he was tall, thin, stooping, and sallow and mournful of countenance – must have escaped from a civilian practice which, because of his ignorant incompetence, had yielded barely enough money to keep him supplied with watery soup and a few crusts. Some of his diagnoses and treatments were so ridiculous as to be unbelievable by all except his victims. Well, I had seen what I assumed to be centipedes moving around in the holes and trenches we occupied ­– perhaps an eighth of an inch thick and five inches long. Sometimes, I would find one curled up in the blanket I wrapped round me when resting. And one day my left hand swelled painfully. Between my little and third fingers I found a yellow spot. For over 24 hours I stood the pain, but by then the hand and the forearm had swollen to twice their normal size and, under my left armpit, a swelling throbbed. I knew this poison was spreading rapidly and could be fatal. I had to visit that wretched medico. What do you think he said? “You have had a poisonous bite, but I can’t do anything about it. Take a Number 9 pill. It might help to clear the blood.” That too is absolutely true. I walked away, the pain reducing me to moans and tears. I wandered off towards the beach, deserting my Company, but not caring any more. To be shot would have been a relief. At some point along the track I found a small, marquee tent with a Red Cross flag flying above it. I entered and received a kindly welcome from a Sergeant member of the Royal Army Medical Corps**, who listened to my story while I removed my tunic. The shirt also had to come off, the arm so swollen that the Sergeant helped me by pulling the garment over my head and peeling the left sleeve off last of all. An officer made an examination; his speech suggested American origin, especially when he, with a penetrating gaze right into my eyes, asked, “Can you stand some?” Of course, I assured him I could stand anything but the current pain. Whereupon he told the Sergeant to hold my swollen hand – which looked remarkably like some sort of puffed-up frog – over a large basin, keeping apart the little finger and its neighbour. The Sergeant took a firm grip and the Yankee doctor inserted his small blade into the palm side of my hand first, then cut upwards between the fingers and a little way across the back of the hand. Amazed at the quantity of red and yellow muck which had almost filled the basin, overjoyed by the pain receding, I told the doctor about our strange MO. Etiquette, I suppose, prevented him pursuing the subject, but his sympathetic eyes and his care during the following fortnight dispersed all my bitterness. That was my first experience of American kindness and efficiency; more such generous aid from our future allies came my way before that war concluded. The Sergeant led me up a hillside to a small encampment consisting of a marquee and half a dozen bell tents. For beds, the patients had stretchers, the sort that folded up when not in use; each of us had a pillow and two blankets. At regular hours, the only nursing staff I saw – the Sergeant and a Corporal – brought us food, drink and medicines. If not serious, wounds were dressed. Mine they kept open by more squeezing, but the swelling subsided rapidly, while whatever medicine they administered improved my general condition. Most of all, within a few days, the kindness of those men, the generous helpings of good, plain food, and lots of restful sleep, turned a doleful kid into something once more resembling a soldier. I began to take a real interest in everything. Looking around, I saw that this little Field Dressing Station stood on a hilltop in full view of the enemy, its only protection the large Red Cross flag at the top of the flagpole. Occasionally, Turk shells would howl past us, but none would hit us, of that we were sure. Could one rely on that today? From the part of the Front my pals occupied, sounds of the usual sort drifted up to us; frequent rifle shots, bursts of machine-gun fire, the bang-howl-crash of shells from smallish field guns. Turning to my right, I faced a difficult sort of battlefield; in the background, a range of harsh-looking hills called, I believe, the Anafarta Heights (I did know the names of the main, geographical features at that time, but this is the only one I remember, probably because, with my low-level type of imagination, this name suggested the possible condition and emissions of this girl Ana after she had eaten one of the tall tins of baked beans and fat pork which all too rarely came my way). Ranges of lesser hills ran roughly parallel to them. On my extreme right was the sea and, rather nearer to me, a strip of land jutted out into it. On its tip I could see an Australian gun battery… for Anzac Cove, of beloved memory, was nearby. The acoustics were such that, when they fired a shell from that position, it set up a terrific roar like all hell let loose. Chocolate Hill*** was inland from that point and when, one afternoon, the Aussies mounted an attack, in that huge panorama it looked like a play staged by midgets: puffs of smoke, flashes, then tiny figures running forward, pausing, dropping down prone, then mingling with the terrain, becoming invisible. I could do no more than wish them success in their raid. I saw a monitor – really a floating gun platform – supporting the action by, from time to time, sending a huge shell into the Turkish rear positions. Anchored some distance out to sea, the monitor had, I was told, just one big gun and a stock of shells. Another day, a huge battleship, which I believe was the Queen Elizabeth****, bombarded Turkish roads miles behind the firing line. I heard that one of her shells killed 62 Turks, but could not imagine who counted them or how. * Number 9: a laxative often issued as a cure-all by Army doctors – and said to be the source of the bingo caller’s somewhat mysterious “Doctor’s orders, Number 9”. 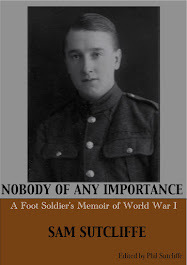 ** Royal Army Medical Corps: referred to by its initials RAMC for most of the memoir. *** Chocolate Hill: scene of fierce fighting throughout the campaign; the soldiers named it for its colour, to distinguish it from Green Hill. **** Queen Elizabeth: probably not, as she had been Hamilton’s flagship for the invasion but, according to Wikipedia, was withdrawn to “a safer position” – namely, Scapa Flow, the Orkney islands, north of Scotland – after the sinking of the battleship HMS Goliath by a Turkish torpedo boat on May 12, 1915, with the loss of 570 crew.